Are you planning to use an automatic transcription service to turn your audio recording to text? If so, audio quality plays a big part in determining how accurate your transcript will be. Even if you’re planning to transcribe a file yourself, clearly recorded audio will help to speed up the process. 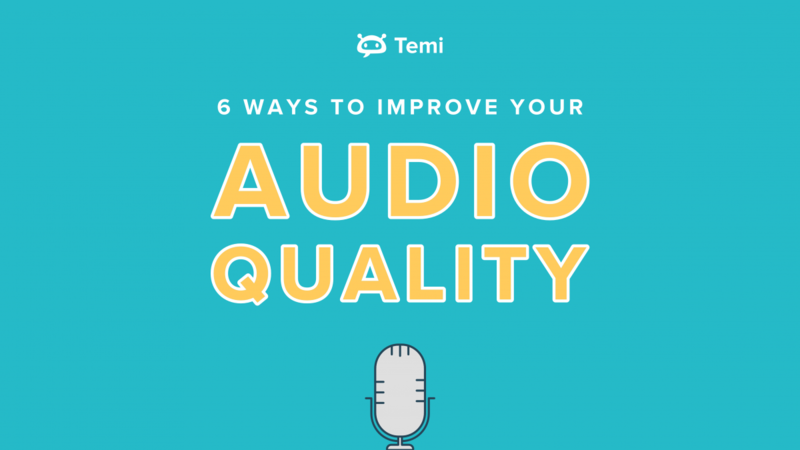 In the infographic below, you’ll find six tried-and-true tips to improve audio quality. Each one is relatively simple but goes a long way in improving the output of your recordings. Having trouble displaying the infographic? Here’s a text only version of our six tips to improve audio quality. Look for areas with minimal background noise and decent acoustics (no echo or reverberation). Enunciate your words more than you would in a normal conversation, even if it feels silly at first. Also, avoid talking directly into the microphone or you’ll distort the sound. It’s surprising how these simple things influence the output of a recording. An external mic or recording device can dramatically improve audio quality. It doesn’t have to be expensive. If you record on the go, you might also consider a portable audio booth. Whether it’s store-bought or DIY, it will make a difference in a less-than-ideal environment. Make sure your phone does not ring or vibrate during the recording. If there was ever a time to rely on “Do Not Disturb” mode, it’s now. You’d rather be safe than sorry! The last thing you want after a successful recording is to run into storage constraints. To avoid this, upgrade your cloud storage and frequently transfer large files (such as photos or video) to a separate device. Again, you’d rather be safe than sorry. Whether you’re a newbie or seasoned audiophile, our iPhone/Android app is a great backup option — if you’re already using your phone, then borrows a friend’s device!